And Get A Top IELTS Score"
The reason you were invited to this page is because I think you can benefit the most from 'IELTS Success Formula'. After 3 years in the making this book series has just been released, and YOU can be among the first people to take advantage of its power! Finally you can put behind you any failures to achieve your target IELTS score, any doubts that you can ever get Band 7, 8 or higher, any insecurities about your English skills. Or, if you're a teacher - you can save your students from all that. If you can read and follow instructions, with this book you CAN get the band score you need. The score that will enable you to acquire the profession you choose, in the country where you want to be.
" So, what's in the book? " This is not just a book of tests - it has a formula for success. First, it teaches you the best ways to understand and solve IELTS tasks, next it gives you complete IELTS 'fitness training', then it tests your performance with a full IELTS test, so you are truly test-ready. You will learn how to avoid many, typical problems and mistakes uncovered by research on thousands of test takers through IELTS-Blog.com.
" Hang on, why do we need another IELTS book? What makes this book different? " Many IELTS books and e-books focus on just one component of the exam (such as Writing or Speaking) - we cover the Listening, Reading, Writing and Speaking, in-depth. Most IELTS publishers exclude the grammar or vocabulary from their books, to sell separately - we have included IELTS-specific grammar and vocabulary modules in our book. Many IELTS books require audio, but it is sold separately - our package includes everything you need to study, as it comes with audio MP3 files. This is a complete guide for your IELTS exam preparation, it's very reasonably priced, and you won't be asked - unexpectedly! - to pay any extra. Most IELTS authors show you a Band 8 sample answer without telling you WHY it's worth Band 8, or how YOU can write at a Band 8 level - we include Band 6, 7 and 8 samples, and we explain what makes the difference between them. Many IELTS e-books are intentionally made not printable - our book can be printed after purchase. Most IELTS authors don't communicate with their readers - we offer dedicated support and answer your questions on our books. And last, but not least - we actually consulted our students and asked what features THEY wanted to see in this book. You told us what you needed, and we listened.
" And who exactly are the authors? Can they be trusted ? " We - Simone Braverman and Stephen Slater - are the people who spent the last 3 years writing, re-writing, testing and perfecting this book. This isn't, however, the first book we have ever written. You probably know me, Simone, as the founder of www.IELTS-Blog.com (a website dedicated to IELTS preparation, with about 13 million page views a year) and the author of very popular "Target Band 7" and "Ace the IELTS" books. You may remember Stephen as the author of IELTS On Track book series, endorsed by the Centre of English Language in the University of South Australia. He also is a former university professor (20+ years of IELTS experience) and one of the authors of our free IELTS course, which you took, on how to create a positive impression on your examiner. "IELTS Success Formula is generally helping to get better at all tasks and gain understanding of the structure of the exam. I think this book is crucial for good preparation and is the best in the market. I improved my listening dramatically from 6.5 to 8.5! I think all aspects of the book are very helpful and important. I personally like the fitness activities and IELTS Writing Doctor, I think it is a great idea to include it in the book. The book's explanations of the tasks are so clear and show common mistakes. I also improved my spelling as well. Thank you Simone and Stephen! You published the best IELTS material ever!" "...to my surprise, I achieved 7.0 in Writing, 7.5 in Reading and Speaking, and 8.0 in Listening"
"First of all I would like to say a big thanks to you and your team for your great help and guidance. I have taken the IELTS exam many times and I wasn't getting required band score. Every time I took the test, I got 6.0 or 6.5 in one of the modules. With the help of this book and sample exam questions on your website, I got Band 7 in each module in the Academic IELTS test. Thank you so very much for all the support to students like me. You are doing a great job. Keep up the good work and keep inspiring people like me. Directly or indirectly you are the reason for many smiles today." "...My score is now 7.0 (up from 4.5)"
"IELTS Success Formula helped me improve my Listening skills. Now that I know the all patterns of questions in the Listening test, I can make use of gap time between sections. I am excited to see how helpful your textbook is. IELTS Success Formula is easier to understand than any other books I have ever read." "I would like to especially thank you and the team at IELTS-Blog.com for all the support with my IELTS exam. It is my absolute pleasure to let you know that I have got my IELTS results and scored 8! I purchased 'IELTS Success Formula' only last month (I should have bought it earlier along with your other publication, Target Band 7). After this decision of purchase, it was only a matter of 4 weeks before I got my results. My Writing band score improved from 6.5 to 8. This task couldn't have been possible to accomplish without those two books and IELTS-Blog's writing correction services. My success obviously came from IELTS-Blog's entire service offerings, as I have never attended a single IELTS preparation class, I think it is only fair to mention that I should also credit all of my hard work to my success as well. Thank you Simone and thanks IELTS-Blog.com!" "...the first time I am getting a score this high since I started taking the IELTS exam!" "The IELTS Success Formula was very helpful to me especially with the skills of writing, reading and speaking. It's awesome! I noticed a lot of improvement with all the skills. The most helpful part of the book was the Writing chapter. It was so good that the topic I read a few minutes before I started the exam was exactly the writing question in the Task2 essay. I needed an overall Band 7 score. I got overall Band 7, with 7.5 in Listening and Writing - it's the first time I am getting a score this high since I started taking the IELTS exam. I got all I needed for IELTS. My result will help me to get my professional certification. I just want to say "Thank you soooooo much for that book". It's simply awesome." "It has brought me so much closer to the high Writing score I must achieve"
"As Arabic is my first language, writing English effectively and accurately is my greatest need. I have found the Writing section (especially Task 2) of IELTS Success Formula very thorough and helpful. For example, the Task 2 section clearly identifies how many types of task there are. A detailed description of each type is provided with easy examples to follow and learn from. In this way, I have learnt how to analyze any writing task, know which category the task belongs to and thus how to totally organise the structure, which in turn makes the writing part easier to do. So, after reading the question, you will know exactly how to structure your writing - whether the writing task is divided into 3 or 4 paragraphs, how linking sentences could be used in a professional way and how to introduce and conclude your topic smoothly and easily. I really like the part of the book on the use of sentence linking words. I learnt how to link my sentences using varied linking words rather than just the boring way of listing: firstly, secondly... I loved the alternative options you describe, like, "First and foremost", "Yet another reason", etc. IELTS Success Formula covers just about everything you will need. It has brought me so much closer to the high Writing score I must achieve." "I clearly realized why I scored Band 6 in the previous exam." "Writing chapter was a great help. I have not seen such a detailed book that gives a full insight into writing professional responses to both task 1 and 2. So far I have been trying to give more literary quality to my writing responses but now I have learned that professional tone comes from formality. The secret of keeping formal style and professional tone in writing enabled me to get over the fear of the IELTS writing tasks. My target score is at least Band 8. It will pave my path to Harvard!" "I thought that it was similar to other textbooks... but then, to my surprise, I found so helpful and uncommon hints!" "Dear teachers, thank you very, very much for your textbook! I have been preparing for the IELTS exam for 1.5 years. I have had several IELTS tutors via Skype, I have finished IELTS writing courses with a British teacher. I have read several textbooks for IELTS students. Despite this great experience, I was not sure in my knowledge and I couldn't dare to take my exam before buying your textbook. I bought your book and, at first, I thought that it was similar to other textbooks, so I didn't read it for about one week. But then I started to open different pages and, to my surprise, I found so helpful and uncommon hints in it! I noticed that I became more confident about my answers. You explain what examiners would like to see in detail. So, now I can concentrate on these specific details. Before this textbook I couldn't surely realize what I should do in each part of the exam. I feel that you tell students: "Pluck up your courage, you can do this for sure! It is not as difficult as you think! Just 'absorb' our tips!" 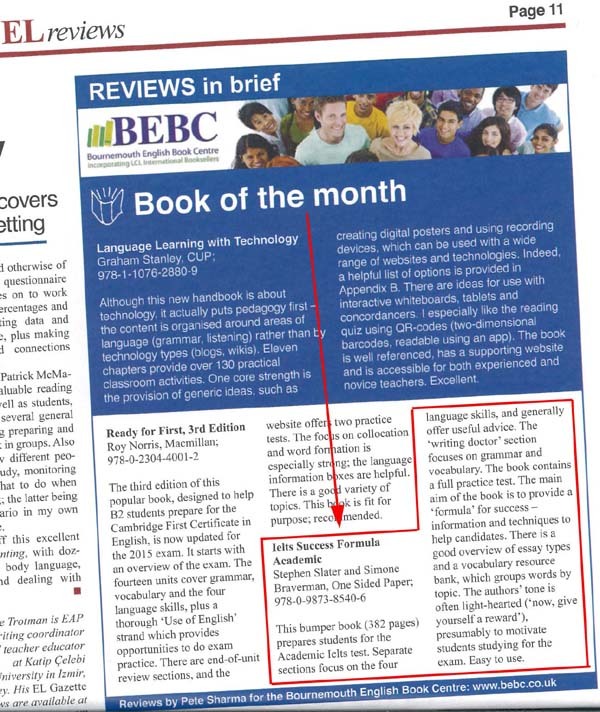 "...guaranteed as a very helpful material for those who wish to achieve a better score in the IELTS test." "I know Simone and Stephen have been working really hard for many years to make the book possible for us. I really appreciate your huge effort to make it happen. My reading speed also has improved significantly by practicing "7 fundamental to make your reading test a success" and other tips in the book. I was not able to complete all the questions in the Reading test within 60 minutes before (due to my slow reading), but after applying all the "Techniques for answering reading tasks quickly and accurately" and the 7 fundamentals from the book I am now able to finish the reading test in 60 minutes and get more correct answers as well. 2. The book provides a lot of valuable and useful techniques and hints for 4 skills as all in one and therefore my friends won't need to purchase additional books. "I have read a lot of IELTS books and none of them were as good, and well organized as the Success Formula"
"The best part of the book is the IELTS writing Doctor. Very well explained and points were clearly stated. It helped me with the proper sentence construction and gave me more ideas for different vocabulary words to be used. "...it gives you exactly what you need"
"I found the Speaking chapter to be the most helpful, because of comparative answers. Also, a problem that the book solved for me was teaching me to plan my writing ideas. I already recommended your book to many friends and colleagues as I found it very useful. The reason is, it gives you exactly what you need, and most important, it gives you examples of incorrect answers, then a better answer and finally the best answer. Most other books are just giving you an answer, which based on my experience, is not the best way. "Strongly recommend IELTS Success Formula to people who are trying hard to get a higher score." "I've been preparing for the IELTS test for the third time and IELTS Success Formula has been the only book I can rely on. One of the things I particularly like about IELTS Success Formula is its systematic approach and its variety of topics, examples, and especially the sample answers which I could compare with my own. Another impressive feature of the book is the section which shows the correction of errors made by many international students - this really helps me to identify my weaknesses. I also like the way I am able to practise building complex sentences by using the key phases and variety of vocabulary which are provided in the book. I strongly recommend IELTS Success Formula to all people, like me, who are trying hard to get a higher score and improve their English level. ... but what do teachers think? A very good question. You may be right to think that students are easy to please and haven't had a chance to use and compare all that many IELTS books. Teachers, on the other hand, make better critics - they have years of experience in IELTS preparation; they know what works for their students and what doesn't. "...390 BRILLIANT pages absolutely packed with superb examples and guidance"
"My passion for IELTS germinated in 2007 when I started to appreciate that, for almost all UK university applicants whose first language was not English, an IELTS score was a pre-requisite to entry. Not only that, for medical professionals, achieving a high score of 7.0 in each mode was essential. Often these students have got as far as scores of 7.0 in most, but not all, parts of the test. Sometimes they have already taken the test five or six times already and they are running out of both money and self-confidence. Furthermore, they have to face the ignominy of being forced to sit the entire whole test again, every time, even if are only below 7.0 in one single section - with the risk that one of their previous scores may deteriorate next time around leaving them no better off than before! What to do here? Has Simone got the answer? Simone and Stephen's new book is called IELTS Success Formula and is specifically aimed at my types of students - top end achievers, usually already in possession of a first degree in their own language and or with postgraduate or medical qualifications already under their belts. They only have one, crucial element missing - a high IELTS score. You can tell I was hopeful - and I was not disappointed! Firstly, IELTS Success Formula consists of 390 pages + the provision of audio recordings and it is presumably the product of professional lifetime of research and collaboration between the two co-authors, Simone Braverman and Stephen Slater. Now length in itself does not signify anything - you could theoretically produce 390 thoroughly bad pages - but my observation of them is that they are 390 BRILLIANT pages absolutely packed with superb examples and guidance and all within a clear and comprehensive framework. Secondly, the book is well laid out. A bright and cheery blue and yellow cover with a glorious photograph of ecstatically smiling students is followed by a punchy checklist of ticks as to what the book is going to offer, why it is different and what it is going to reveal for the aspiring IELTS student to whom a high score is mandatory. An enthusiastic "HELLO" introduction establishes teamwork and fun and then a choice of journey: plan A crash course preparation or plan B comprehensive preparation. Next, we go on to a clear contents page with neat graphics. Each skill is supported by fitness activities and I particularly liked the section called "Writing Doctor" which begins "grammar can sometimes make you feel a bit sick, right?" When my students next turn to me, sometimes on limited budgets, and ask me, which one book would you recommend - out of all you know worldwide - will I select IELTS Success Formula as my first book of choice for them? "...one of the best IELTS preparation text books around"
"As an IELTS assessor and tutor, I would have to say The IELTS Success Formula is one of the best IELTS preparation text books around. It is very user-friendly with clearly set out sections for each part of the IELTS test and very useful tips and reminders throughout, reminding students about common errors made in all four sections as well as comprehensive advice as to how to reach an above average IELTS score. The exercises are easy to follow and there are many opportunities given to consolidate the advice in order to maximise the learning for the students. "...a solid foundation for my IELTS test prep courses"
"After reviewing IELTS Success Formula Academic, the recent collaboration of authors Stephen Slater and Simone Braverman, I have decided to adopt it as my text for the upcoming spring semester. I find it to be a comprehensive, user friendly resource that will provide a solid foundation for my IELTS test prep courses. It will afford my students maximum opportunity for achieving their desired IELTS band scores. An impressive feature, the Fitness Activities section, breaks down each part of the test to focus on practice with individual question types. These activities can be individualized to allow students to improve in specific areas of weakness. Other features, such as 'What if I...', which addresses problems that have been encountered by past test takers, and the Famously Misspelled Words List critical for the listening section of the test, provide valuable support for increasing students' band scores.
" So, Simone, how much will it cost? " As you would have seen from students' testimonials above it is possible to spend hundreds or even thousands of dollars on IELTS prep aids and courses before finally achieving the required score. 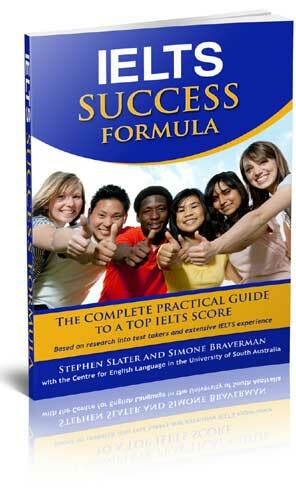 So what would a book with a Formula for Success cost, your shortcut to a great IELTS score? Very little, compared to your investment in the exam fee ($300+), your time spent on multiple exam attempts, the heartbreak of failing to achieve your goal and the fear of closing doors on your future. Don't expect to pay hundreds for this ultimate solution to all your IELTS needs. You won't even be asked to pay $100. Save your money and treat yourself to a very nice dinner out with friends or family, to celebrate your IELTS victory after you get the score you need. Today you have an opportunity to grab this unique, time-limited offer, that won't last long. Please note that this offer is only available to the first 125 participants. If you are on this page and you see the message "Sorry, the offer has expired" it means that you've missed the boat. So it's one of those "now or never" moments. Act quickly, or kick yourself later. "Yes, Simone! I need the IELTS Success Formula!" FREE BONUS #1: Five complete IELTS practice tests for download ($20 value). The set includes 5 listening, reading, writing and speaking papers with answers, 5 sets of audio listening materials with tapescripts, example recordings of the Speaking test, sample writing tasks by IELTS examiners and more. FREE BONUS #2: A Speed Reading Course ($17 value). The course will teach you how to double your reading speed and accelerate your reading and learning abilities. FREE BONUS #3: Have your Speaking skills assessed with a special 25% discount. You will be guided step by step to help you record yourself answering real IELTS questions and the evaluation team will send you a personal report with suggestions how to score higher to your email. Pay only $5.95 (everyone else pays $8 for the same service). FREE BONUS #4: A massive 45% discount on writing correction. 4 tasks of your choice (essays, reports or both) will be checked by a team of experienced IELTS teachers. You will get the tasks back marked within 24 hours (an Express service! ), including your estimated IELTS Band Score, comments and suggestions. Pay only $17.60 (everyone else pays $31.95 for the same service). FREE BONUS #5: You will be entitled to our personal support - ask any questions you may have about the Success Formula and we will respond personally to your query. This is something I can't promise to everyone, as there is simply not enough time in a day to respond to hundreds of emails. But I can promise to this to YOU and the other 124 members in the specially selected group. A 100% money back guarantee. If you're not happy with the material, for any reason at all, please let us know within 60 days. We will thank you for your time, apologise for the inconvenience, return your money and you will get to keep the bonuses. Co-author of "IELTS Success Formula"